We now know one of the finalists destined for Old Trafford on Saturday, 10 October - Wigan Warriors - after a demolition of Huddersfield on home turf. Two more games remain of the Super League season, join us tomorrow for the penultimate encounter between Leeds and St Helens from 19:30 BST. Until then, thanks for your company. Goodbye. Wigan are assured of their place in the Grand Final after a remarkably dominant performance against Huddersfield, who failed to match their regular-season consistency. It would be a huge surprise if Leeds v St Helens followed the same one-sided pattern. Both teams have tasted victory in this fixture this term - Leeds notably in the Challenge Cup semi-finals, while Saints brought the Rhinos crashing back to earth after their Wembley joy in the Super 8s. Saints have won five Grand Finals to Leeds' six. Only one of the two has the chance to extend their record. You can follow that game with us here on BBC Sport, and listen to full commentary on BBC Radio 5 live sports extra, BBC Radio Leeds and BBC Radio Merseyside. "We've done alright but that's not good enough. "We're not happy with coming here and getting beaten again, there's no point me telling you we're going to learn from it. "We got bullied tonight, and we have to work on that in pre-season because we can't keep allowing that to happen. "Actually starting well in games will help us, we never gave ourselves a chance. "I think Wigan were too good for us, we never got out of the blocks and they were good for the scoreline." "I'm really pleased with the effort of the players. I thought we defended well but I don't think we were that good with the ball. "We need to improve - the two teams playing tomorrow are very good. "This was a big one, against a really good team who can defend. Next week it's an easy week. We know what we need to do and say in our processes. "Going to Old Trafford there's no point not winning, it's not good enough, we've got to go there and perform." Quote Message: Absolutely dominant, Wigan tonight. They have just been white hot. It's going to take an unbelievable team to beat them. Absolutely dominant, Wigan tonight. They have just been white hot. It's going to take an unbelievable team to beat them. Remarkable achievement for Wigan and Shaun Wane to make a third consecutive Grand Final. Wane, in particular, deserves great credit for nurturing a young, home-grown squad and taking on the work of Michael Maguire. Good English coaches at all four teams in the top four. A fillip for our great sport. Wigan feast on tired defence to release the barnstorming Tony Clubb to cross to the right of the sticks. Matty Bowen kicks the goal. Wigan rampant. I doubt Leeds or St Helens will be enjoying watching this. Matty Smith kicks for touch. Wigan sense blood. Scott Grix gets there in the nick of time to deny Wigan another try through the onrushing Liam Farrell. No switching off even at this late stage. Penalty goes Huddersfield's way but they are being suffocated in attack. Story of the game. Even Leroy Cudjoe watches agonisingly as his pass floats into touch, along with their Grand Final hopes. Wigan's Matty Bowen could be celebrating a double triumph this autumn. His current club are destined for the Super League Grand Final on 10 October, while his old club North Queensland Cowboys take on Brisbane in Sunday's NRL Grand Final. You can hear that one from 09:15 BST on BBC 5 live sports extra on Sunday. Another Giants set ends with ball being turned over and Wigan bring the ball away from their own 40 metres. Wigan in the Grand Final for three years in a row if they see this out. Will Saints or Leeds be joining them? There'll be fireworks, whoever it is. Wigan defuse the danger with Matty Bowen 'diving on the grenades'. Namesake Smith drills a kick into touch. Turning the Giants round and eating up the clock. Smart play. Smart enough for England play? Wonder is Steve McNamara is watching? Brett Ferres sticks to what he is good at which is playing on the edges and getting over for a try. Huddersfield needed that. Great angle from the Danny Brough pass. Bounced off the post pad on his way through too. Can the Giants prove this man wrong when he said it was over? That's the right way to go about it. Brett Ferres is an extremely gifted rugby league player but not the man you want trying to poke a grubber through. His kick bobbles into touch and Wigan get the scrum head and feed. Matty Bowen obliges. 26-2. Wigan are now four converted scores ahead. Erm... Wigan possession was actually what came next. Been a relatively quiet night for George Williams, a running half-back who hasn't had the space to set off on a jinky run. Wigan stifling the Giants and then causing havoc with a Matty Smith kick. The Huddersfield players are struggling to cope. The penalty goes the home side's way and Matty Bowen is to go for two. This goal - inevitable - will sink the hearts of those Giants players, coaches and fans. Penalty, penalty... what usually comes next? Let's see if it rings true for the Giants here! Another drop out. What can Huddersfield conjure up here? Something special maybe from Leroy Cudjoe? Quote Message: I thought it would be a one-score game - I was half-tipping Huddersfield. But with the mistakes and the penalties - you can't do that in big games. You've got to be squeaky clean in big games. I thought it would be a one-score game - I was half-tipping Huddersfield. But with the mistakes and the penalties - you can't do that in big games. You've got to be squeaky clean in big games. Wigan will drop out after Aaron Murphy forces Dom Manfredi back behind his own line. Sounds daft to write off a team with more than a quarter of the match to play but Huddersfield have had little or no momentum to play with. When they have found a gap to strike, Wigan have pulled ranks to nullify the threat. I had Giants as my tip to win the competition a week ago. Adamant. At this moment, my career as a clairvoyant is officially over. Quote Message: It's like CSI, or Poirot, or Sherlock Holmes. Answer the question, video ref. Give it or don't give it. It's like CSI, or Poirot, or Sherlock Holmes. Answer the question, video ref. Give it or don't give it. Scott Grix tries to deny John Bateman a try with a trip, and Ben Thaler deems the act sufficient for a penalty try after the Wigan centre fails to ground. The position came from a great break by Joe Burgess, after Wigan held out Huddersfield in front of their own sticks. Matty Bowen provides the extra two points from the tee. Game over surely? Where do Huddersfield go from here? Back across the M62 with nothing to show if they don't sort themselves out. Wigan have kept them at arms length for much of this game. Jermaine McGillvary gets the penalty after the ball is stolen with two in the tackle. A glimmer of hope for Huddersfield? Quote Message: As soon as the ball went into Dom Manfredi's hands, there was only one result. He can finish, whatever situation you put him in. As soon as the ball went into Dom Manfredi's hands, there was only one result. He can finish, whatever situation you put him in. Well, credit to Dom Manfredi. A fine finish after a slick move to the right. The ball was moved out to him on the flank and he cut back inside to touch down despite pressure. On the back of that penalty too. Matty Bowen strokes over the goal to add the extras and Wigan edge closer to Old Trafford with a key try. On the back of all that pressure? Wigan get the penalty. That will frustrate Paul Anderson. Quote Message: It was a poor pass from Jamie Ellis, which slowed the play down and gave the defence an opportunity to get to Jermaine McGillvary. But certainly encouraging signs from the Giants. It was a poor pass from Jamie Ellis, which slowed the play down and gave the defence an opportunity to get to Jermaine McGillvary. But certainly encouraging signs from the Giants. Jermaine McGillvary denied in the corner by impressive Wigan scramble defence. Much more positive from Huddersfield but Wigan defensively were so solid. It came after Brett Ferres held up by Liam Farrell with Giants trying to batter the cherry and white wall down. Better from Huddersfield as they make way down the left and then they get the penalty. It's tapped and the Giants are in a hurry. Ball sails into touch as Wigan try to work the edges and it gives Giants a scrum head and feed on halfway. Quote Message: Danny Brough is one of the best kickers in the game, he's put some height on it, Matty Bowen has had some problems in some big games with that and they're putting no pressure on it. Danny Brough is one of the best kickers in the game, he's put some height on it, Matty Bowen has had some problems in some big games with that and they're putting no pressure on it. Neither side imposing themselves with these early sets. Huddersfield put it up high from Danny Brough but Matty Bowen gathers unopposed, a second before he's bulldozed by the kicker himself. Break as he gingerly gets to his feet. Tough fella, the Queenslander they call 'Mango'. Joe Burgess soars to take Danny Brough's kick. No flutter of nerves from the Warriors winger. Wigan bring the ball away from their own sticks. Jermaine McGillvary takes a carry for Giants. So important he and Aaron Murphy share the workload. Wigan restart and Giants get the ball. Who's put their hand up so far? From an England perspective, John Bateman certainly has. There's a wealth of back-row options, not to mention some top candidates in the centres too, but Bateman has shown himself to be adept at both. Great finish for the try. Generally, Wigan's forwards have been excellent. There was a spell where Giants could barely lay a finger on them as they were marched down field on every carry. Still, a lot can happen in 40 minutes. One of these teams has it in their destiny to book an Old Trafford trip. How exciting is that? If tonight's game doesn't whet the appetite then perhaps tomorrow's meeting of old Grand Final foes Leeds Rhinos and St Helens will. The two most successful clubs of the summer era, with six and five wins apiece, go head-to-head at Headingley for a place in the showpiece final on 10 October. Saints won the competition last season beating rivals Wigan while Leeds' last visit came in 2012 with victory against Warrington. You can listen to the game on BBC Radio 5 live, BBC Radio Leeds or BBC Radio Merseyside and follow it here on BBC Sport. Paul Anderson, known in the game as Baloo, is as animated as any rugby league coach up in the stands, as a number of smashed plastic bottles will testify. However the dressing room cameras show he's a calm customer when faced with his players in the sheds. His coaching skills, proven this season, will be called into play during this break. His team needs to find a foothold and cause Wigan some problems. Wigan's dominance is reflected in the scoreboard at the DW Stadium, where tries from Ben Flower and John Bateman, added to two goals by Matty Bowen put the home side 12-0 up with seconds to play. Danny Brough's goal ensured Giants avoid the big '0' at half-time, but they have struggled to impose themselves and release the powerful backline that has proved key to their third place finish in Super League this season. Quote Message: It could have been 18-2 or 20-2, Wigan have been that dominant. While there's a lot of work for Huddersfield to do to turn it around, they are capable of it. But I just think the determination of the Wigan team is there for everyone to see and I can't see them blinking. It could have been 18-2 or 20-2, Wigan have been that dominant. While there's a lot of work for Huddersfield to do to turn it around, they are capable of it. But I just think the determination of the Wigan team is there for everyone to see and I can't see them blinking. Danny Brough sinks the kick with ease and Huddersfield have something on the board at the break. No prizes for guessing the happier of the coaches. Wigan lead by 10 points. Giants get a penalty and with the hooter gone, Danny Brough will kick for goal. Somehow Wigan hold up Jermaine McGillvary. So close for Giants! Unselfish that from Dom Manfredi, who scored four in the win against Castleford last week and immaculately finished by John Bateman. Huddersfield not out of it but at the moment there's not a massive amount of encouragement for them. They have struggled to break the line so far as we close in on the break. Quote Message: Wigan kept the ball alive, kept offloading, the ball went up and Dom Manfredi got so high to catch the ball. He kept it alive like a basketballer and found John Bateman, who was too strong. Wigan kept the ball alive, kept offloading, the ball went up and Dom Manfredi got so high to catch the ball. He kept it alive like a basketballer and found John Bateman, who was too strong. John Bateman and Dom Manfredi combine in the corner from a Matty Smith kick to ease across in the corner. Aaron Murphy couldn't get up higher than Manfredi, who had the presence of mind to feed Bateman, and he had the strength to force his way over the stripe. Matty Bowen is unable to convert but the try ticks the scoreboard on further in Wigan's favour. Are they Grand Final-bound? Still plenty of footy to play. John Bateman gets a penalty for interference at the ruck and Wigan punt it out for a tap inside the Giants' half. Given how potent the attacks of both sides are, it's a testament to the intensity of the defence we've only had eight points so far. Joe Burgess and Jermaine McGillvary have 50 tries between them so far this season, but the only score of the game came from a prop forward in Ben Flower. Refreshing to see throughout this season that Jack Hughes and Larne Patrick have been allowed to play against their parent clubs after loans between Wigan and Huddersfield. Hughes has become a key figure in the Giants pack during his temporary spell and will be a miss when he joins Warrington next season. Quote Message: Great play from Huddersfield. They've decided not to kick the ball - they've handed the ball over one metre from the line and given Wigan the challenge of six plays to clear their line. Great play from Huddersfield. They've decided not to kick the ball - they've handed the ball over one metre from the line and given Wigan the challenge of six plays to clear their line. It's catching. Or not, so to speak. Sean O'Loughlin knocks on and the Giants get some possession. The ball is worked to the right and then left, but Jake Connor is tackled by John Bateman. Brett Ferres tries to batter his way through but the ball is turned over on the last inside Wigan's 10. Huddersfield's execution is letting them down at the moment. They seem a little caught between minds at times. Pass or not to pass? That hesitation is not helping. They've brought on a new front-row, can they lay the platform? Wigan were certainly bossing the ruck early on. Tony Clubb almost bashed his way over for Wigan. Good defence from the visitors. Then on the last a kick is dabbed through but Jermaine McGillvary watches it dead. Tap on the 20 for Giants who then get a penalty for offside. Wigan have rotated the front row with big powerhouse Tony Clubb on. The Giants are preparing Eorl Crabtree in response. Back in the action, Huddersfield's Leroy Cudjoe tackles Matty Bowen in the air on a last tackle play to give Wigan a chance to find touch and field position. Swinging end to end at the moment. Jake Connor unable to take the ball in close to the Wigan line after Danny Brough delayed the pass. Wigan get the ball back but they've been pegged back inside their own 10 by ferocious defence. Matty Bowen taps the ball dead to concede a goal line drop out. Scott Grix with the kick that bobbled awkwardly. Huddersfield starting to bare their teeth finally. Great leg drive by Dom Crosby, on his 100th career appearance. Knock on called against Wigan on the next carry, though, and the Giants get head and feed. Quote Message: It's a philosophy of the club. When you get to those important games, you should take the two points and keep that scoreboard ticking over. It's a philosophy of the club. When you get to those important games, you should take the two points and keep that scoreboard ticking over. Matty Bowen makes no mistake from inside the 20, just to the right of the sticks. Wigan extend the lead. Joe Wardle coughs up the penalty and Matty Bowen has called for the tee for Wigan. First time we've seen Huddersfield threaten, good break by Scott Grix got them downfield. Close-quarters passing and handling proves their downfall in the end, as Craig Kopczak's pass to Jamie Ellis was spilled. Better, though, from the visitors but they concede a penalty on the resulting Wigan set for offside. They need to sharpen up discipline here. Penalty, penalty, try is how it normally goes. Wigan are making metres with every carry, rolling Huddersfield back. Scott Grix fielded a Matty Bowen kick on his own line, but Wigan then concede a penalty to give some respite and a chance to find field position. Quote Message: Wigan are just hot and Huddersfield have got to hold their nerve. A few problems early in this game for them to solve. Wigan are just hot and Huddersfield have got to hold their nerve. A few problems early in this game for them to solve. Michael McIlorum loses the ball in the tackle to ease some pressure on the Huddersfield line. What can the Giants do here? Knock on, that's what. Even Danny Brough hasn't got his radar on. Wigan scrum just inside their own half. Wigan have come out all guns blazing. They've got a mobile pack and lots of strong carriers. Then a kick from John Bateman on the last forces a drop out. Huddersfield are rocking at the moment. Almost back-to-back scores from Wigan down Huddersfield's left edge but they couldn't release the pass after great work by Olly Gildart and George Williams. Quote Message: Brilliant try by Wigan. Just now and again, they drop the inside ball and it catches the opposition unawares. That's certainly what they did there. Brilliant try by Wigan. Just now and again, they drop the inside ball and it catches the opposition unawares. That's certainly what they did there. Ben Flower took a reverse pass from Matty Smith on a fine line and left the Huddersfield defence so flat-footed to power through for a first try for Wigan. It all came on the back of Aaron Murphy's error which forced a drop out. The Giants winger didn't have his foot in touch when he touched a Matty Bowen grubber 'dead' and Wigan punished the error. The home side roar ahead. Oliver Gildart might have run it out a moment ago but fronts up to force Leroy Cudjoe in touch. He's got an eye for a try, too, that young Wigan centre. Full of confidence. Quote Message: By running it, Wigan are trying to bring the winger up and give the edge defence something to thing about. By running it, Wigan are trying to bring the winger up and give the edge defence something to thing about. Huddersfield look to push the ball wide early on and gain good ground in the first set. Danny Brough peppers Matty Bowen but the Warriors full-back takes it neatly. Wigan try to run it on the last on the responding set but Oliver Gildart is forced into touch. We're off. Wigan get us under way, first touch of the ball for Huddersfield. Fireworks and a raucous crowd greet the players on the way out of the tunnel. DW looks absolutely packed out. We're almost there. Huddersfield Giants: Grix; McGillvary, Cudjoe, Connor, Murphy; Brough, Ellis; Kopczak, Robinson, Huby, Wardle, Hughes, Ferres. Replacements: Crabtree, Bailey, Lawrence, Ta'ai. Two to go. Then we're off. Butterflies kicking in yet? Yeah, me too. Whatever you think of the new format this season, it's definitely ignited the excitement. We've been there and won there before, so going to Wigan and winning is not strange to us. We've just got to remind ourselves of that feeling and what it takes to do that. One of the most intriguing match-ups tonight will be the battle between 27-try Super League top scorer Jermaine McGillvary on the Giants wing and Wigan's Joe Burgess, who has 23 scores. made the Super League Dream Team earlier this week, edging Leeds flier Ryan Hall and the prolific Tom Lineham from Hull to take the two wing berths. The incentive now is to impress England head coach Steve McNamara enough to win a place in the squad for the three-Test series with New Zealand next month. What do you make of those teams? John Bateman back in the centres for Wigan? Surprising given how natural he's looked in the back-row. Still a big threat. As for Huddersfield, their backline is magnificent but they've got to win the battle up front. Surprised also to see Ukuma Ta'ai on the bench, he's a real weapon. It's very even. Huddersfield are a huge team and very well coached. We're four very evenly-matched teams and it's got the makings of two fantastic games. John Bateman returns at centre for Wigan, with Joe Burgess reverting to the wing as he makes his final appearance for the Warriors before joining Sydney Roosters in 2016. Josh Charnley drops out, while prop Dom Crosby makes his 100th career appearance. Huddersfield will be able to call upon the experience of prop Eorl Crabtree from the replacements bench. He has recovered from the knee problem that kept him out of last Friday's defeat by Leeds Rhinos. Time for some teams yeah? Have Giants found the formula? As Nobby says, it might be tough for Huddersfield to pick themselves up after last week's dramatics. However with a winner like Danny Brough in their side you fancy they will. He has the quality and the toughness to drag his side through tonight. Plus talismanic prop Eorl Crabtree is back and his presence will be a major factor. Giants know they can score points against Wigan, and they have to back that threat if they're going to win tonight. Quote Message: It's a tough challenge for Huddersfield to come here to the DW Stadium, but they're well capable of it. The big question for me - are they emotionally ready for it after that huge disappointment (against Leeds)? To have a game like that snatched from you at the death, it takes a resolute coach and a resolute system to bring a team around from that. It's a tough challenge for Huddersfield to come here to the DW Stadium, but they're well capable of it. The big question for me - are they emotionally ready for it after that huge disappointment (against Leeds)? To have a game like that snatched from you at the death, it takes a resolute coach and a resolute system to bring a team around from that. Nice of Nobby to tee me up like that. Good man. Wigan are unbeaten on home turf in the league since St Helens won the derby in June 2014 and are on a run of 20 home wins in a row. thrashed 47-12 six days ago. Home advantage key for Wigan? Quote Message: The four teams that are all left are all capable of beating each other. (Wigan coach) Shaun Wane will be thrilled that they're here at the DW. They haven't been beaten for about 15 months here in Super League. The four teams that are all left are all capable of beating each other. (Wigan coach) Shaun Wane will be thrilled that they're here at the DW. They haven't been beaten for about 15 months here in Super League. It's fair to say Huddersfield don't tend to enjoy their end-of-the-season trips to the DW Stadium, losing heavily in the old-style Play-Offs in 2014 and 2013. They've also lost all three meetings with Wigan this season, but more positively for coach Paul Anderson did win both regular season fixtures against the Warriors in 2014. Overall the home side have 26 wins to the Giants' 14. They don't come much tougher in Super League than a trip to Wigan. Big, noisy crowd, expectations high. Let's have a look at the form of these two clubs in previous meetings. Click on the Live Coverage tab at the top of the page to select your commentary of this match. BBC 5 live sports extra, BBC Radio Manchester and BBC Radio Leeds are all covering the game, which kicks off at 20:00 BST. Might be a good idea for me to let you know how to keep across tonight's events from the DW Stadium with the BBC. Welcome then to BBC Sport's live text commentary of the first of Super League's semi-finals for a place in the Grand Final at Old Trafford on 10 October. Wigan come into the game having had the League Leaders' Shield snatched from their grasp by Leeds, having done all they could to beat Castleford and finish the campaign on 41 points. They've been to Grand Finals before and have proven their mental toughness in these situations. Conversely, Huddersfield have won just three of 14 'knock-out' fixtures in the Super League's play-off system before this campaign. This season's format has favoured their undoubted consistency, and they were mere seconds from avoiding defeat by Leeds last week - can they turn it on in a one-off, sudden death encounter? The next 80 minutes will tell us plenty about both these teams' ambitions. Having just about recovered from the sheer drama and excitement of the regular season finale which saw Leeds Rhinos crowned League Leaders' Shield winners, the focus now turns to the final four in the race for Old Trafford. Leeds play reigning champions St Helens in Friday's second semi-final, but tonight it's all about the action at the DW Stadium. 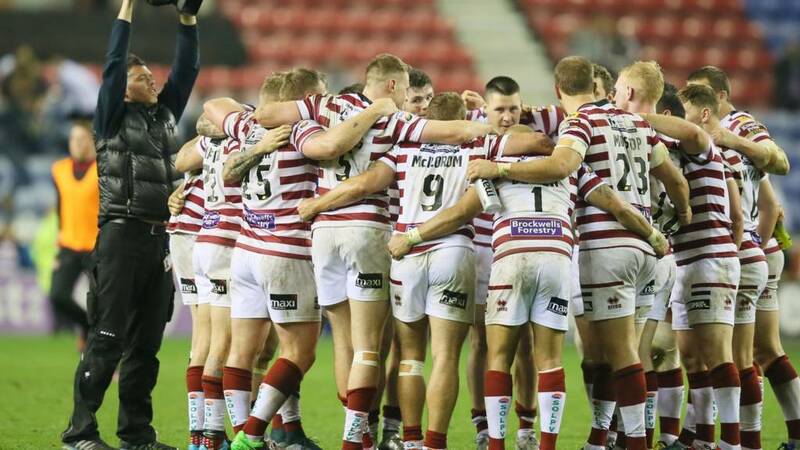 Wigan Warriors, pipped by mere points difference to the £100,000 prize money, a shiny piece of silverware and a World Club Series spot, have home advantage in their bid to secure a third straight Grand Final appearance. In their way are a Huddersfield side who had won five games in a row before their run was ended dramatically by the Rhinos last Friday, and whom have never been to a Grand Final in the summer era. Who will triumph? Stick with us here to find out.